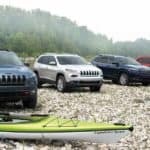 Current News and Research | Cueter Chrysler Jeep Dodge RAM " "
WHY BUY A 2019 RAM 1500 Why Buy a 2019 Ram 1500? The Ram 1500 is the most thoughtfully executed full size pickup in existence and when it comes to Drive-ability & Cabin Interior, the Ram 1500 is only rivaled by Mercedes Benz. I mean, how many trucks win awards for interior design? Not many, but Ram does…. Jeep Wrangler JK vs JL – The Obvious and Not so – Obvious Differences.